High power mid drives ebikes are great, in fact I believe that at power levels less than 4000W there is nothing else out there that can compete with a mid drive ebike. When running a ‘low power’ mid drive like the BBS02 that peaks out at about 1300W you can get away with using almost any nickel-plated steel cassette on the market and you generally will not have to deal with catastrophic failures. If you are using higher power levels like the 50 Amp 2500W Ludicrous BBSHD controller or the 3000W Cyclone motor then you will find that normal cassettes start to become a real problem. On average I tend to burn through about one cassette every 2-3 months and I have yet to find one that I think will hold up under a high power mid drive for any real period of time. All that changed when I decided to spring for a new $32 CS-HG62 11-36T 10sp new take-off cassette from bikewagon on ebay and threw it on my Phat Phuk ebike. This article will discuss the myriad of problems with cassettes and high power mid drives and why I believe the CS-HG62 will perform exceptionally well under high-power mid-drive singletrack riding. They can wear out very quickly : As the chain stretches the notches deepen and get farther apart. Sometimes if you replace the chain you have to replace the cassette because the old worn cassette will skip with an unstretched new chain. The cogs will bend : This is usually a problem with one of the three grannies. I’ve had several cassettes where the teeth have bent, or in one case with an aluminum 42T granny and a 60 amp BBSHD controller, there was a catastrophic failure of the entire granny gear. Steel only for cassettes. Once the cogs bend it is nearly impossible to get them to bend back properly, even if removed and squeezed on a bench vice. 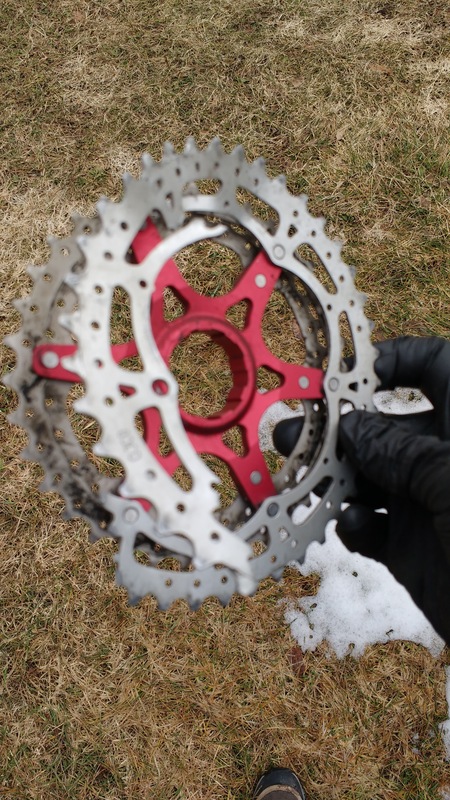 The cogs eat into expensive aluminum freehub bodies: When the cassette is steel and the cogs are loose and separate then under high power they tend to eat away at the aluminum freehub body. Before you know it, the freehub body is so bad that it is nearly impossible to get the cogs off. Most cassettes I’ve purchased over the years allow you to separate the individual cogs. I’m not sure why most companies do this, but I presume it is because sometimes people have one or two cogs that are troublesome and want to just swap out those problem cogs in the cogset. 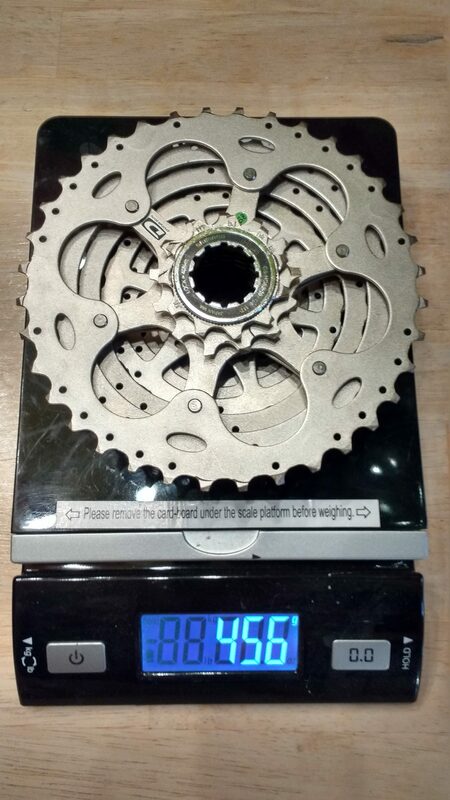 I would not recommend this for a number of reasons, the primary one being that a properly worn cassette will have about equal wear on most of the gears. When riding a cassette I tend to favor the granny that is 2 or 3 grannies in from the mega granny. This keeps wear down on the biggest ring which I tend to reserve for very deep powder or super steep hills. I do the same thing with the lowest racing cog (11T on this cassette). I tend to save that for when I want the highest top speed on the flats. You want to configure your ebike so that you are riding with the middle cogs most of the time, that will help keep the wear even on your cassette. When I swap out the chain I will often try it with the existing worn cassette. If it skips in more than one gear, I will generally just swap out the cassette. If the cassette is already heavily worn then it makes little sense to set it up with an unstretched chain as you are begging for skips, jumps and possibly catastrophic chain failure. The most use I get out of once cassette is 2 full chains worth and after that, I always swap the cassette out for the third new chain. That being said I have a chain stretch tool and I don’t swap the chains when the chain stretch tool tells me to, only when the chain starts skipping on the cassette. The chain and cassette will generally stretch together and if the chain is skipping it is almost always because the chain stretch has outpaced the cassette wear (unless there is a bent cog). Lubing your chain before every ride is the best thing you can do to save money on chains and cassettes. I use Pedro’s GO lube which you can get a liter of for only $9.89 from bikeman right here. You can suction-refill the tiny applicator bottles that the local bike shops usually sell and a liter will last you at least 3 years of daily riding. I estimate that lubing my chain after every ride triples the life of my chains and cassettes. When shopping for a cassette for a mid drive ebike you should not even consider any cassette that is not entirely made out of steel. There are several cassettes that have most of the gears as steel and some of the grannies as aluminum. At normal human power an aluminum granny will be fine, but with a higher powered mid drive ebike it is simply a mistake to expect that an aluminum cog will be able to survive the wrath of your throttle heavy thumb. I would also give preference to any cassette that has all the cogs tied together with a single or several rivits. This will cut down dramatically on freehub wear. 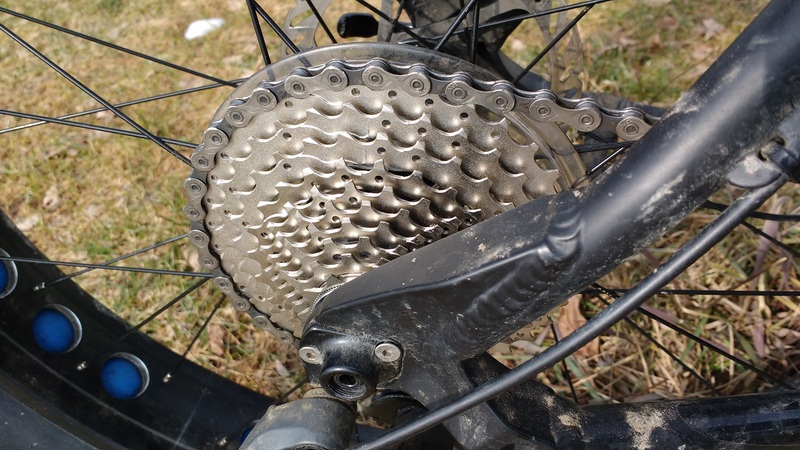 Most modern-day bikes that cost more than $500 have an aluminum freehub body (not steel) and these aluminum freehub bodies do not take kindly to steel cogs getting pulled on with several horsepower. Swapping out freehub bodies is not going to happen, so instead you need to find cassettes that have locked cogs. Of the 10 or so cassettes I’ve replaced in the last several years, the Shimano CS-HG62 is probably the most robust one I have set my paws on. The range is pretty ginormous with a 11-36T range. Having a 36T granny is really nice when you have a fat bike or a 29er as the larger wheel diameter. The 36T granny will work with almost every 10-speed derailleur on the market unlike the 42T Sunrace cassettes which can have some clearance issues with X9 derailleurs in the lowest granny gear. I’ve managed to make it work with the Sunrace 42T & X9, but it was very close with the clearance. 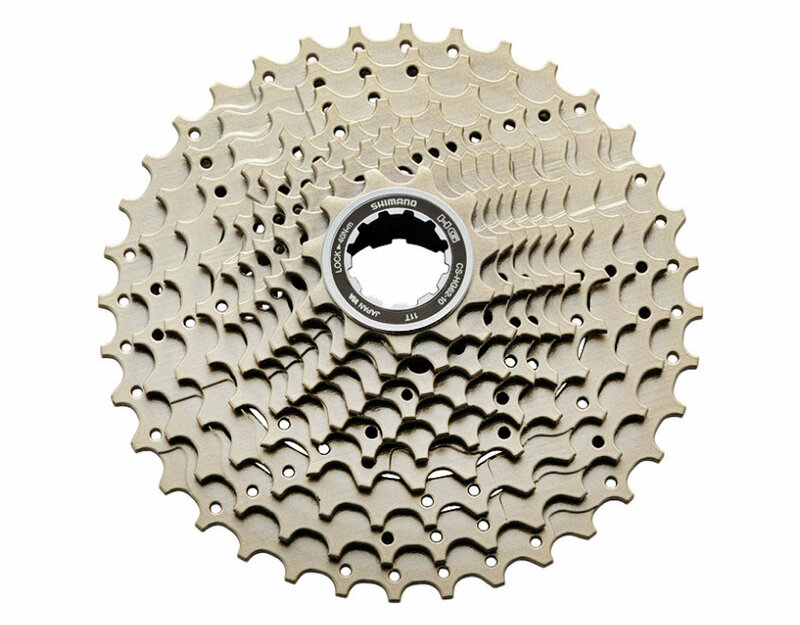 If you do opt for the larger 42T Sunrace 10 speed cassette make sure to get the all-steel CS-MS3 and NOT the aluminum granny CSMX3. This cassette is very heavy, but when it comes to cassettes and high power mid drives, heavy = good. Notice the heavy steel rivets on the grannies. Although I have only ridden the CS-HG62 for about 2 weeks, I expect to get many months of use abuse out of it. The cassette is one of the heaviest I’ve ever weighed, but the nickel-plated steel construction seems to be very solid and there are no aluminum parts that I can find on it anywhere (tested with a high power magnet). Over the years I have tended to buy 90% of my bike parts from SRAM, so it is refreshing for me to actually recommend a Shimano product for a change. I think for 2000+ Watt mid drive ebikes the CS-HG62 is the weapon of choice for 10 speed rear cassettes. A ton of helpful info here, as usual. Keep up the great work big K! I realize that you can go through a lot of cheap steel cassettes for the price of a Rohloff. But throw in a broken derailleur here or there and what do you think about longevity of a Speedhub? Hey Karl, I’m pretty new to ebikes and have recently been enjoying your articles. While I’m new to ebikes, I do come from a technical background, including Automotive racing transmissions and torque converters. With that said, there is a lot of ways to improve the durability of any of the “one-way-clutches” by moving to “sprags” or “roller-clutches”, and they wouldn’t even have to be custom made per se, just find existing ones that are used in cars, so that they are plentiful and cheap, and machine them into existing bike parts. Here are some video links describing their operation. Very cool. Any of those solutions would be better than the current Pawl powered freehubs. I’m doing an article on the DT Swiss 350 which uses a ratcheting mechanism that is much better than pawls. Given your well-documented love of big grannies(the inanimate variety), I’m surprised you haven’t tested and reviewed Sram’s EX1 cassette. Come on, a 48 tooth big cog has to inspire a considerable amount of tingling.